Four days before Vancouverites hit the polls, UBC students are pushing for youth voter engagement and advocating for a city-wide rent freeze with a banner drop from the roof of the Nest. 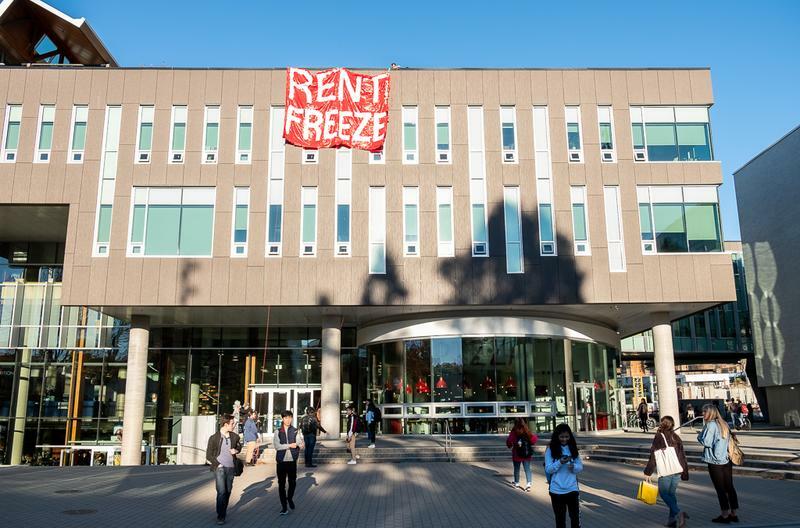 A group of students from the Social Justice Centre (SJC) hung the large, red banner that reads “RENT FREEZE” from the roof of the Nest at approximately 4:30 p.m. today. The demonstration mirrored the group’s first banner drop on Imagine Day. SJC Co-Chair Jacob Fischer-Schmidt said that while both banner drops aim to raise awareness about the municipal elections, the one that happened today is “more pressing” because students can now vote in advanced voting until October 17. “The first drop on Imagine Day … was just in general of the election. Now that they can vote today, it’s even more pressing,” he said. Following the stunt, the students planned to bike to Kitsilano Community Centre to vote. While Fischer-Schmidt said he did not know how many people would attend the trip, he reiterated that it would draw attention to issues like rent-freeze and civic engagement. The students are affiliated with the Coalition of Progressive Electors (COPE), a municipal left-wing party that has advocated for ending homelessness, redistribution of wealth and a city-wide rent freeze to tackle housing unaffordability. COPE city council candidate Jean Swanson said she is beyond pleased with the demonstration — and with the engagement of UBC students working on her campaign. Swanson attributed the dedication of COPE volunteers on campus to the party’s calls for a rent freeze and her history of social justice and anti-homelessness advocacy. “I think they like our policies, and I think they like candidates with a background who have a history of fighting for social justice, so you can tell it’s not just the spur of the moment,” said Swanson. SJC member Mauricio Trujillo agreed. “Rent freeze is one of the most viable options to making the housing market in Vancouver a lot more affordable for people and stabilizing it by reducing speculation,” he said. When asked how this policy would be balanced with Vancouver’s low vacancy rate, Trujillo said that rent-freeze would not be the only measure but would also be complemented by other policies for housing affordability. The AMS, which operates the building, did not immediately respond to a request for comment.